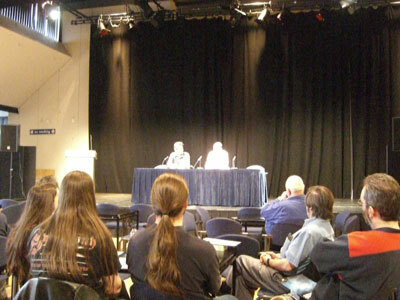 Alt.Fiction 2007 gets off to a rousing start with talks from Mark Chadbourne, james Barcla, Stan Nichols and a bundle of other writers. There is a fantastic selection of book stalls that I’m yet to even get near – I’ve stepped out for a bit to eat lunch and let the brain cool down after all the listening. I’ve been making Ipod mic. 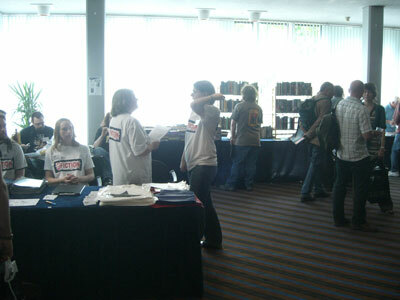 recordings of the talks so far. Unfortunately they aren’t good enough quality to post as they wouldn’t do the writers involved justice but they will be useful to review later. Highlights so far include Mr Chadbourne’s comments on fantasy genre and the marketing that surrounds it, and Stan Nichols critique of stiff, starchy prose in fantasy. 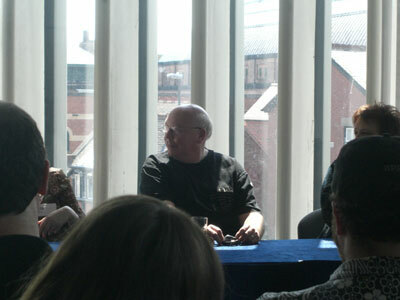 Still to come – writing workshops with Graham Joyce and Harry Harrison and the GoH Iain M Banks.